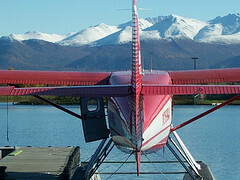 Fairbanks, Alaska Sightseeing Trips. Arctic Circle Van Tours on the Dalton Highway from Fairbanks, Alaska Mail Plane Flights, Gates of the Arctic National Park Excursions from Bettles, Fairbanks Riverboat Discovery Cruise and Rail Tours to Anchorage, Denali National Park and Talkeetna. 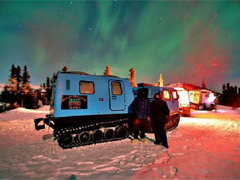 Fairbanks - your Gateway to Adventures! Historic Village Tour: Fly over the pristine wilderness and visit the historic Athabascan Native Village on the the banks of the mighthy Yukon River, 8 miles north of the Arctic Circle. A guide will introduce you during the 3-4 hour trip to the life-style and history of the village. Anaktuvuk Pass: Eskimo culture, glacially carved mountains over 6400 ft high and the world's largest Barren Ground Caribou Herd - Welcome to the Gates of the Arctic National Park. Travel with a Eskimo guide and explore how ancient heritage blends into modern ways and the traditional subsistence life. Full Day Tour. If you've ever read Mark Twain you know of his days as a riverboat captain. Did you know that Jack London was a riverboat pilot as well? Here's your chance to experience the adventure these renowned writers enjoyed as you cruise aboard the authentic sternwheeler riverboat Discovery II, rated the number one boat tour in North America. Enjoy a lively narration as you view a trapper's cabin, log homes, and a bush pilot performance. Visit the home of four time Iditarod champion Susan Butcher, as you pass Trail Breaker Kennels along the Chena River. Learn first hand about kennel life and the challenges that go into making a champion dogsled team. You'll make a stop at the historic site of a Chena Indian village to see native crafters in action and to learn abut Native Alaskan hunting and fishing techniques at an Athabascan Fish Camp. Sightseeing flight along the Dalton Highway and the famous Alaska Pipeline. 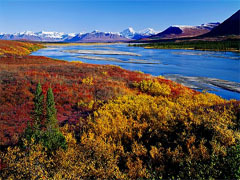 Cross the Yukon River and you'll be in the land of the " Midnight Sun " above the Arctic Circle. 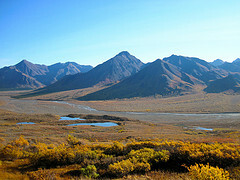 Bettles is located on the southern slopes of the Brooks Range and the famous Gates of the Arctic National Park. Enjoy a riverboat tour on the Koyukuk River to the nearby Native village of Evansville - founded during the great gold rush in 1898 - and see how rural Alaska really is. Optional flightseeing tours are available. The tour includes lunch at Bettles Lodge. Travel along the Dalton Highway, formerly known as the North Slope Haul Road. 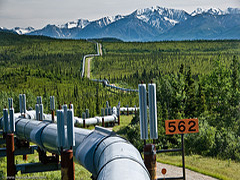 After a quick orientation in Fairbanks, you will drive on the Steese -, Elliott - and Dalton Highway along the Trans Alaska PIpeline to the Arctic Circle. You will learn about the gold mining in the region. Don't forget to take your camera as you will see magnificent mountain scenery and vast Arctic Tundra and mountain valleys. 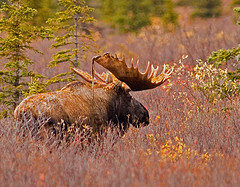 This is the home of mighty moose, black - and grizzly bear as well as migrating caribou. Your tour guide will give you ample time to take pictures at the Yukon River Bridge Visitor Center and the Arctic Circle signpost. This is also the place you'll receive your official Arctic Circle Certificate. Return to Fairbanks 10:30 - 11:30 pm. See the city sights of Fairbanks, visit Gold Dredge No. 8 (gold-panning and lunch included) and cruise on an authentic sternwheeler riverboat on the Chena and Tanana Rivers aboard the Discovery II.The 3 1⁄2 hour cruise, rated the number one boat cruise in North America, will take you into the heart of Alaska and the heart of a family who has made the rivers of Alaska a way of life for four generations - the Binkleys. You will see a bush pilot taking off from a "bush" style runway, meet four time Iditarod winner Susan Butcher, witness the "wedding of the rivers," and gain insight into the ancient Athabascan Indian culture at an Athabascan Fish Camp. Alaskan Native guides who have worked and lived in Alaska will take you on a personalized tour of the Chena Indian Village. Tret yourself to a relaxing sightseeing evening and soak in the Hot Springs! Our local guide will answer your questions about Alaska as we travel only 60 miles to Chena, discovered and used by natives and early miners. Guided tour of the Aurora Ice Museum included. It features a gallery that includes sculptures, chandeliers, and a bar hand carved of ice. Afterwards you can enjoy the natural outdoor setting of the rock lake which is perfect for a relaxing soak in the hot springs. After 10:30 PM we meet for our return trip to Fairbanks. Food and drinks are available for purchase at the resort restaurant.